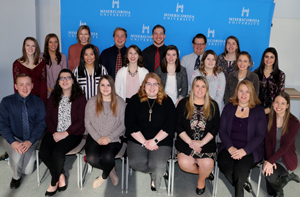 Misericordia University teacher education majors recently received their student teaching assignments for the spring semester during the Student Teaching Seminar in Catherine Evans McGowan Room of the Mary Kintz Bevevino Library. Twenty student teaches participated in the program, which prepares the undergraduates for classroom observation and instruction in several regional school districts. For more information about the Department of Teacher Education at Misericordia University, please call (570) 674-6400 or visit www.misericordia.edu/education. Misericordia University teacher education majors received their student teaching assignments for the spring semester during the Student Teaching Seminar. Student teachers participating in the program, first row from left, are Charles Richter, Mehoopany, Pa.; Katelynn Taylor, Clifford Twp., Pa.; Rachel Polacheck, Exeter, Pa.; Rachel Jones, Hazleton, Pa.; Laura Gilbody, Clarks Summit, Pa.; Tammy Schnable, Dallas, Pa., and Ashley Johnson, Carlisle, Pa.; second row, Tara Malara, Whitehouse Station, N.J.; Cassie Silveri, Plains Twp., Pa.; Kimberly Kowalski, Scranton, Pa.; Mary Patricia Blaskiewicz, West Pittston, Pa.; Emily Seaberg, Tunkhannock, Pa.; Sarah Olsen, Williston Park, N.Y., and Alexandra Stefanides, Forty Fort, Pa.; third row, Kayla Radle, Exeter, Pa.; Cassidy Boston, Berwick, Pa.; Owen Davis, Harrisburg, Pa.; Scott Bargisen, Northvale, N.J.; Cordell Gresh, Pittston Twp., Pa., and Shea Matta, Green Village, N.J.